Sidney Kess, CPA, J.D., LL.M. Is Crowdfunding Easy Money or Tax Trap for the Unwary? When is it OK to Not Meet the Tax Deadline? Tax Cuts and Jobs Act Changing Professional Sports? Will Your Clients Run Afoul of ACA's Largest Penalty? Employee or Independent Contractor for ACA? A recent survey in the Small Business Tax Strategies newsletter revealed your clients' #1 frustration: they don't hear from you enough. And they'd like to hear more. Of course, that's easier said than done. With your busy schedule, it's almost impossible to find enough hours in the day for client outreach – not to mention the challenge of finding time to develop new business (the lifeblood of ANY organization). Fortunately, there's a way to satisfy current clients AND prospect for new ones. And it won't cost you one second of your time. CPA Magazine has teamed with Small Business Tax Strategies to provide a unique business opportunity for you. • We start with Small Business Tax Strategies – the monthly advisory service trusted by thousands of business owners, plus many of your colleagues (AND competitors). 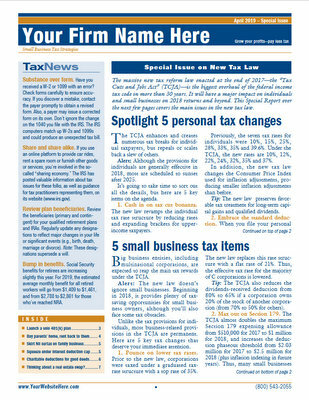 • We replace the Small Business Tax Strategies masthead with your firm's name, an alternate newsletter title, or both – anything you prefer. • We send you a PDF for you to distribute digitally to your clients and prospects ... provide hard copies if you prefer to communicate in print ... or both. No longer will you wrack your brain for better ways to attract new accounts, or to make your current client interactions feel less transactional and more like a true business relationship. You'll also present yourself as a true tax expert, with the kind of articles you'd write yourself – if you had the time. Click here, or call 888-610-1144 for Josh and find out how effective – and affordable – Customized Client Communication can be. We look forward to helping you with your current AND future clients. P.S. Studies show it's TEN TIMES HARDER to land new business than keep established clients. But with Customized Client Communication, you can do both!